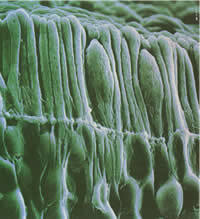 All of the colours that we see are due to the stimulation of cells in our eyes called cones. These are cone shaped light sensitive cells on the retina that change light energy into an electrical impulse that passes along the optic nerve to the brain. 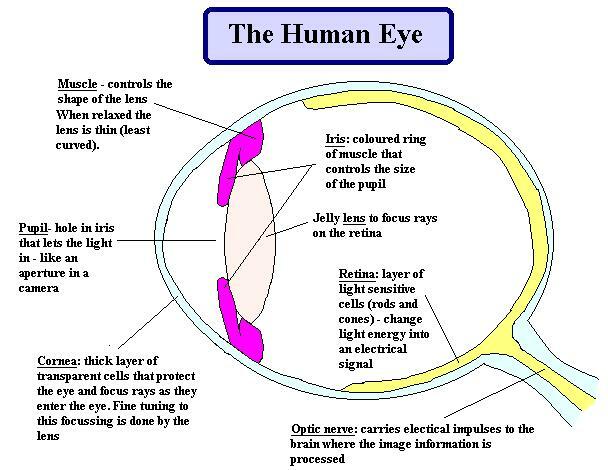 (See where the retina is by jumping to the diagram of the human eye). Human beings usually have three types of cones - animals sometimes have more or less than three! Visible light is made up of photons of electromagnetic energy. Photons of different energy ranges stimulate the cells on the retina in different ways and our brains interpret this by calling that band of energies a 'colour'. The part of the electromagnetic spectrum that has wavelengths between 380nm and 740nm can be detected by the human eye and is therefore called 'visible'. Each band of wavelengths of light stimulate the cones in a different way and we say that there are seven distinct colours in the visible spectrum. (Note that the 'blue' in this 'rainbow spectrum' is a light blue (it's nearer to 'cyan' than 'blue') and the indigo is nearer to the colour we class as 'blue' in colour addition - a deep royal blue colour - the differences come from the first naming of the colours in the rainbow as ROYGBIV). Single cone-type stimulation is acheived by three 'pure' colours red, blue and green. These are called the PRIMARY COLOURS. All other colours are seen as the result of two or three of the cone types being stimulated. 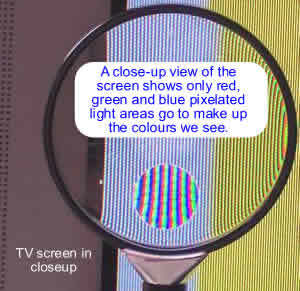 It is therefore possible to simulate ANY colour on a TV screen by varying the intensity of one of these colours on the screen and therefore the amount of stimulation of the cones in our eyes. That is why your colour TV screen only needs to give out three colours. Click on the 'hex number' on the right and select any colour from the palate to find its hex address! Click here for an interactive Java application from the University of Colorado. Now try some questions on Colour.